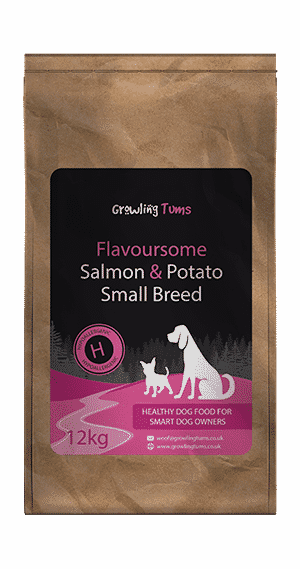 If your small breed dog deserves a treat then Flavoursome salmon & potato is a great choice. Made from high quality Scottish salmon it’s purpose is to give your dog a 100% natural, hypoallergenic diet that tastes so great that they’ll love it immediately. It offers excellent value for money too. Helps your dog dazzle! 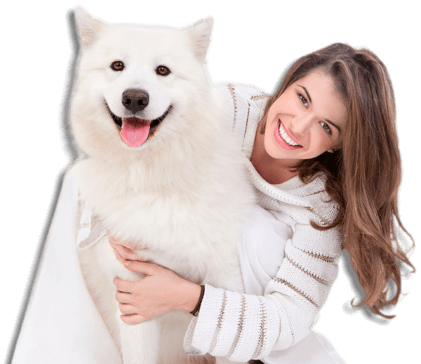 Increases skin & coat health and gives them a natural shine. Less mess to clean up when out for walkies. British Salmon tastes great – Even the fussiest dogs love Salmon & Potato. Nothing artificial added to the food, just ingredients chosen with love. Hypoallergenic which makes it gentle on your dog. No tummy troubles. A completely balanced diet that’s 100% natural, hypoallergenic and made from ingredients so premium our customers are still amazed at how affordable it is. Plus Salmon from the streams of Scotland will captivate the attention of any small breed dogs in the vicinity. 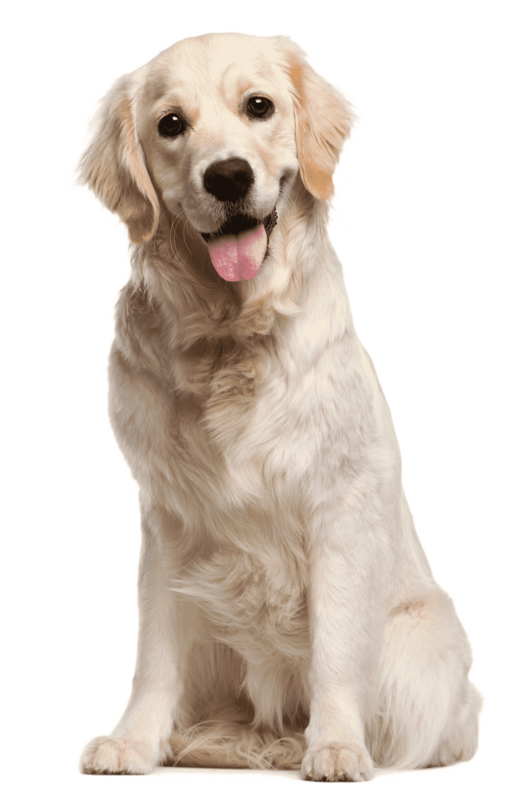 The inclusion of the fantastic four: Zinc, Biotin, Omega 3 & 6 Fatty Acids help maintain healthy skin and coat in dogs. Our customers notice a superb healthy shine! You may think we’re going on about this a bit, but this food is loved by dogs. 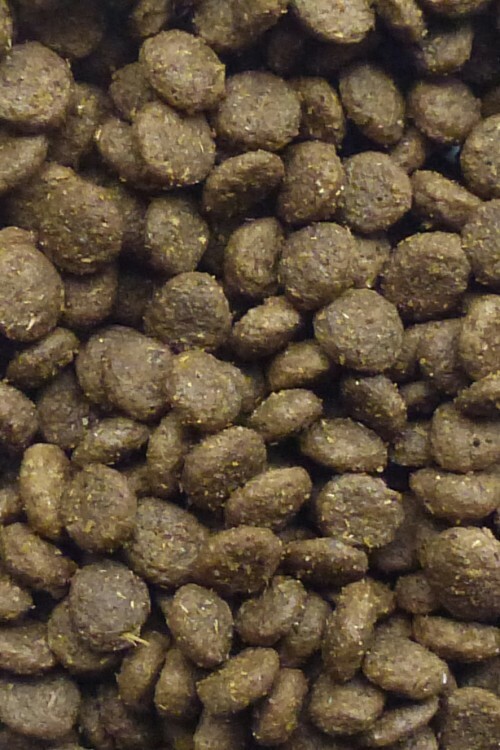 Our customers consistently report that their dogs have never enjoyed dinner time so much. We pack in a selection of premium ingredients and still manage to charge less than other leading brands. We refuse to add any of those naughty ingredients that are known to cause issues with certain dogs. That means our Small Breed Salmon & Potato doesn’t have any wheat gluten, beef, pork, soya or wheat. It’s also free from dairy products, eggs and all artificial colours and preservatives. No longer do you need to worry about upsetting your dog. We’ve aimed to be better than many of the other dog food brands available to buy which is why we strictly monitor what goes in to our food. We don’t use any artificial colourings, preservatives or flavourings because we strongly believe that this has an overwhelming impact on the long term health of your best friend. Just like in a human diet, we take the view that providing your dog with unnaturally concocted ingredients from a lab will have a detrimental affect on the lifespan and health of your dog. A human quality protein source that dogs will go out of their way for. Who likes cleaning up after their dog? I don’t. As we use highly digestible quality ingredients the food is easily digested and there is much less smelly mess to clean up. I have 2 greedy pugs who love this food. I was a little worried changing over from the old food….. Not a problem at all not even a runny poo!! Thank-you growling tums! Will be using this food for good. I buy will be the normal adult. I highly recommend Growling Tums. This small breed food seems to be a top notch product. An ideal size bite for Chihuahua, and other small dogs. The change over is taking place without any apparent problems, dogs eating without any delay, waste produced is small and firm, without any problem smells. Also see my review for the large breed feed. 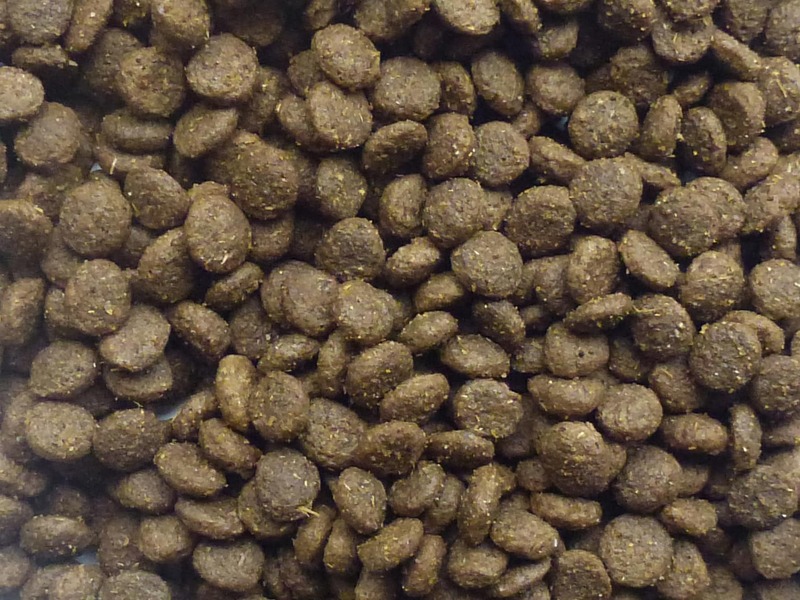 I was very pleased to find a salmon dog food in an ideal size kibble for Chihuahuas who enjoy eating it. No problems so far and change over nearly finished. It also makes an ideal training treat. They haven’t been brought up to be fussy eaters but one of them didn’t like the previous brand that I had bought which was lamb and I didn’t like some of the other ingredients in it, chicken digest? sounds awful! I got the my first bag of this food, and am so happy, i will definitely be buying more. My little westie cross is a fussy eater but also prone to pilling on the pounds very easily with cheaper, bulked up food. Since using growling tums, he has lost weight, phew, his coat is softer, his eyes clearer and he seems to have more energy. I have had a ‘rescue’ Jack Russell (approx 4yrs old) for a year. Came with sad skin problems . Heard Fish & Potato dried food helpful for skin problems/sensative skin, so for have been following that advice & he is doing fine. HOWEVER, the pet food company changed to larger pellets, which he refused to eat !! He is DELIGHTED I have discovered ‘Growling Tums’ and is really interested in his new food ! THANK YOU. Hi there, so far so good, our little dog has tried many dog foods (and yes it has cost us a great deal but all we want is for him to have the right food). This is my second order of the food, Bert is still enjoying it and never turns his nose up at it. Thank you. Ben one of our dogs has megasophagus. This food is ideal for him and he absolutely loves it. Service is also great. Fantastic product. Neither of my chihuahua crossbreed dogs like fish – but they LOVE this. It’s also small enough for the tiny one to eat as well. Thankyou. Will be ordering more very soon. Early days yet but both my dogs absolutely love this food and hopefully my miniature schnauzer loose stool issue are a thing of the past. Thank you. My little Layla pug just loves her salmon and potato. She is 8 years old now and for the first time eats every mouthful of her salmon and potato.. She has a glossy black coat. Perfect stools. More energy and is a healthier weight. Will definitely order again. Sid the pug loves the salmon and potato, well he loves all food, but this suits him very well. Have ordered it several times now. Never leaves any so Sid is a happy dog and his owner is a happy purchaser. Always arrives next day delivery as promised. My nine Patterdale terriers love this, however I do wish they would bring out a light as all have been spayed and prone to weight gain. I have to carefully watch how much they eat because they love it so much. I would recommend this for smaller breeds. Delivery is great and always on the day that it is promised. After having itchy, flakey skin issues with my mini schnauzer who was fed a well known expensive brand of dry food I decided to try your salmon and potato which has solved all itchyness his coat looks amazing and my other dog who is ridiculously fussy loves it aswell! I am so pleased and I recommend it to everyone! Thankyou from a happy customer and dogs! Our customers tell us the following four points make our delivery service great! Don’t run out of food again. Place an before 13:30pm Monday-Friday and you’ll receive your order on the next working day. For more details have a look at our delivery page.